Caused by rapid forceful abduction and extension at MP joint of thumb; skiers fall on abducted thumb or pole forcefully abducts thumb. Stener lesion = ulnar collateral ligament is displaced superficial to abductor aponeurosis. Surgical repair is indicated. (Stener B, JBJS 1962;44Br:869). tear of one collateral ligament removes support from that side of joint allowing phalanx to translate palmarly and rotationally. proper ulnar collateral ligament is tested with thumb in 30 degrees of flexion. accessory ulnar collateral ligament and volar plate are tested in extension. increased laxity greater than 35 degrees in extention and 15 degrees in 30 degrees of flexion = complete tear. soft-end point indicates complete tear. 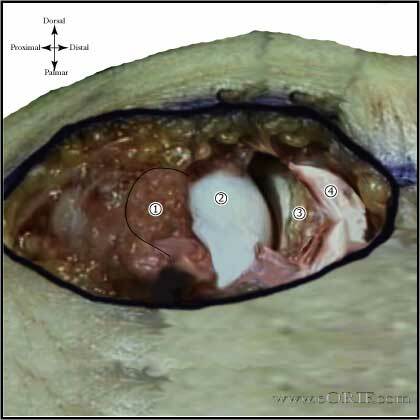 Grade II=partial tear or attenuation resulting in pain, swelling and stiffness but no significant instability. Thumb spica cast for 4 wks followed by removed splint with flexion/extension exercises until 6wks. Avoid radial directed stress such as opening jars/doors fro 10-12wks. Bony = generally avulsion of the UCL insertion from the proximal phalangeal base. Consider arthroscopic reduction and K-wire fixation. (Badia A, Orthopedics, 2006;29:675). Video: Rossenwasser Linvatec UCL repair Using Ultrafix Minimite Suture Anchor. Ask Linvatec rep for CD if you don't have it. Thumb UCL repairs have significantly reduced load to failure compared to intact ligaments (Harley BJ, J Hand Surg 2004;29Am:915). Traction via thumb finger trap and 5lbs suspended from arm. Injection 1-2cc lidocaine into MCP joint. 1.9mm 30° scope inserted radial to the extensor tendon. Hematoma evacuated and synovectomy performed with 2.0mm full radius shaver. 0.035 K-wire inserted just proximal to bony fragment, fracture reduced and fixed with K-wire under arthroscopic and fluroscopic visualization. Thumb-spica splint / cast for 5weeks. Pin removed under local anethesia at 5 weeks. We discussed the risks of operative intervention includeing but not limited to: incomplete relief of pain, incomplete return of function, infection, stiffness, CRPS, instability, neurovascular injury and the risks of anesthesia including heart attack, stroke and death. 10 Days: suture removed, thumb spica cast or custom molded plastizote thumb gauntlet spint for 6 weeks. Daily active thumb MP flexion/extension exercises allowed. No pinching, grasping or resistive motions. 6 Weeks: wean out of thumb gauntlet splint. Begin progressive resistance exercises, occupational therapy. 3 Months: May return to full activities / sport if full functional strength and motion have returned. Avoid radial directed stress such as opening jars/doors for 10-12wks. Thumb gauntlet splint should be worn for any sporting activities.